So that’s an extra £130 per year my mum, aged 81, will have to find from an already stretched budget. 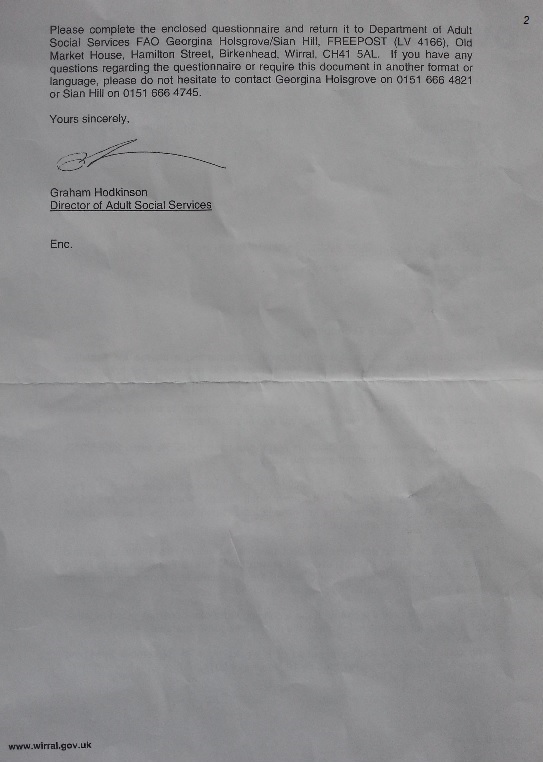 Can she manage to stump up the cash and stop the council from taking enforcement measures? My mum lost both her parents during the war and became orphaned, aged 12, in 1944. Happily married in 1957, she and my dad set up home in Wallasey, Cheshire, which was also the beginning of a long-standing relationship as rate payers to the local council. My dad died in 1985. This council though, are still here. Fast forward to today… this piece of Cheshire has become Merseyside, and apart from a deluded and godforsaken journey up a cul-de-sac known as the poll tax, the old rates have become known as the Council Tax. 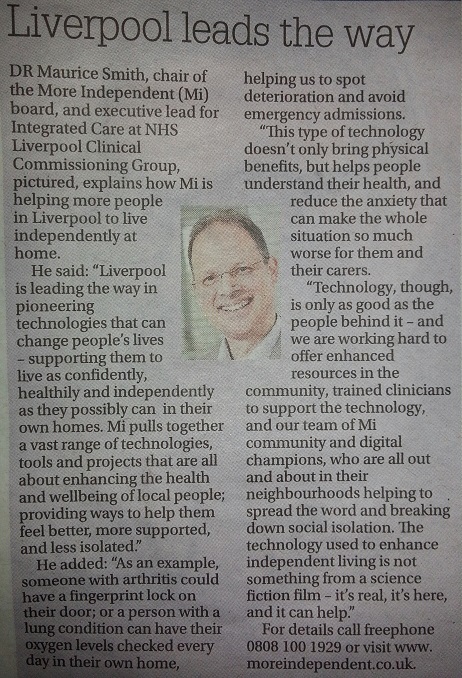 I also tweeted Dr Maurice Smith, below, chair of the More Independent (Mi) board, and executive lead for Integrated Care at NHS Liverpool Clinical Commissioning Group. He was kind enough to respond very quickly. 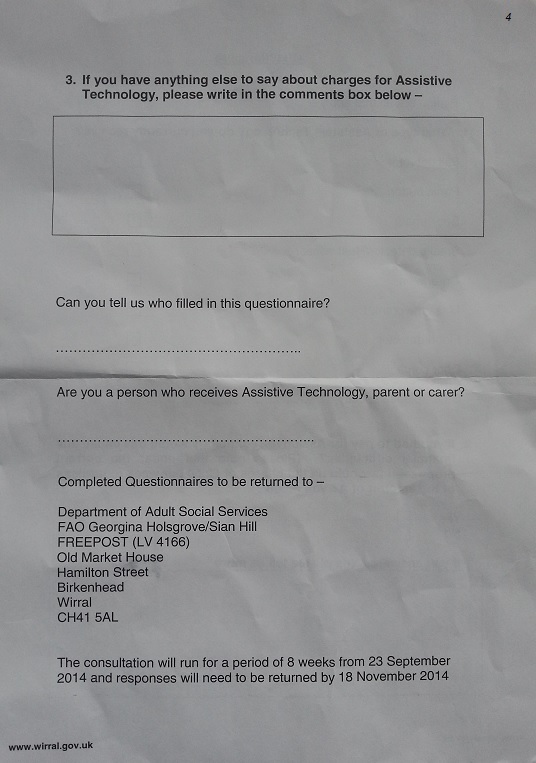 It seems Liverpool City Council don’t charge if you qualify under their Social Care Rules. Which is how I think it USED to be done at Wirral, until some uncharitable bright spark came up with a way of clobbering senior citizens. 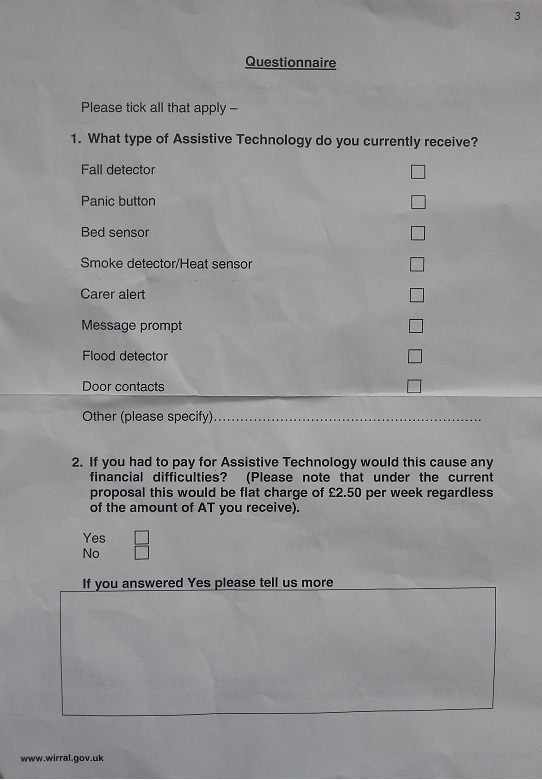 Okay, living confidently, independently and healthily sounds great, all very desirable, and may come at a price for those who can afford it… but what about subsisting and being SAFE in your home through the minimum level of assistive technology? Why should struggling people who’ve propped the council up all of their lives, and paid to keep axe-wielding bureaucrats in comfortable high-paying jobs and plush, refurbished offices be forced to pay for their own safety and peace of mind? RIP my mum, Margaret Cardin, who died today, aged 83.